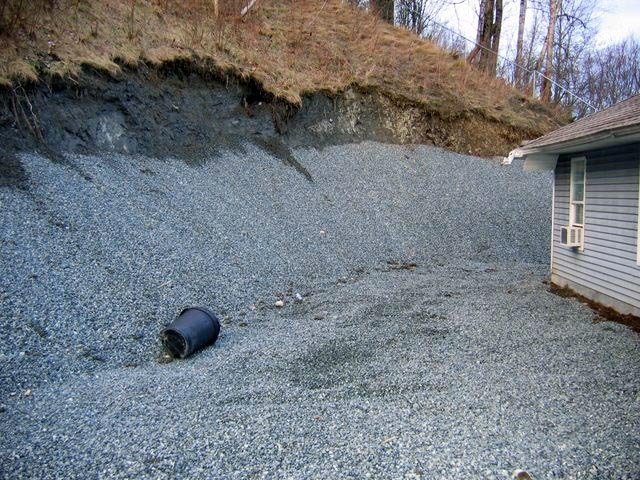 THE ISSUE: Three prior contractors, money missing, and a huge mess to clean up… and nothing was yet installed. 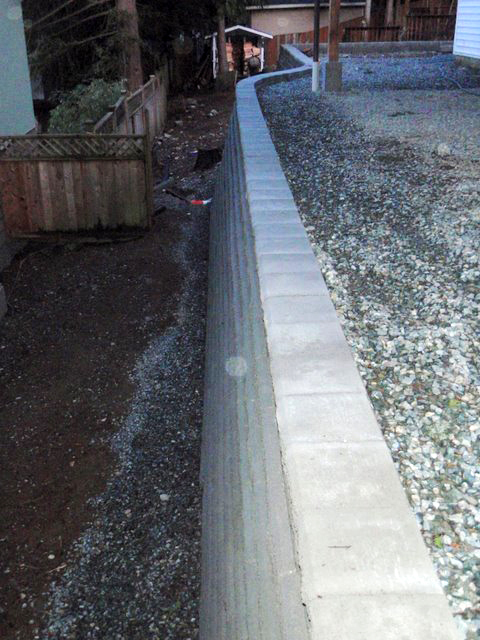 We received a phone call to quote a retaining wall in the area. At the time, we were unable to see the site for a two week period due to a heavy schedule. The owner agreed that if they could not find someone to see the job, they would call back and book a site meeting within a couple of days. Nine months later we got a call back to see the project. In that time, the owners had hired three different contractors. 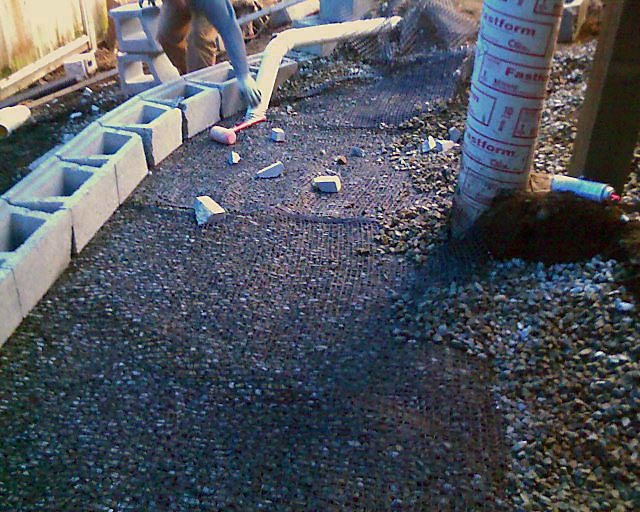 The first contractor quoted the job very cheaply (unfairly and impossibly low), and pressured for and obtained a SUBSTANTIAL deposit (without a contract) to take advantage of the low price right away, before they got busier. He was never heard from thereafter. This happens all the time to very nice and good people, by con men and crooked contractors. They were told exactly what they needed to hear to trust and believe in the wrong person. 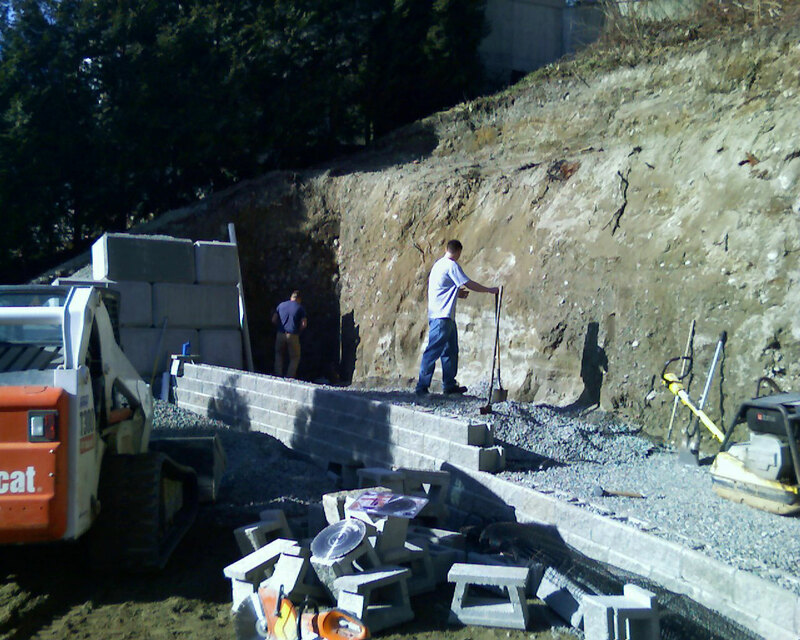 The second contractor was simply a helpful individual with a lot of work to do, who promised they’d be able to help as soon as they had a break in their schedule. 6 months later, they were still unavailable and eventually declined the project. No contract and no money were exchanged. 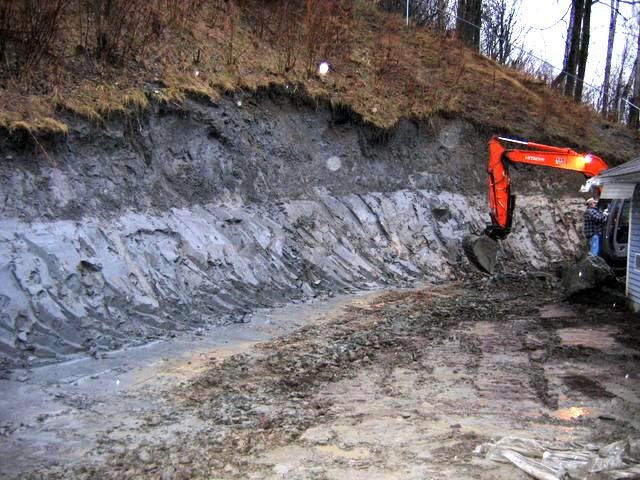 We removed almost 50 loads of clay, mud, debris from the site to complete the excavation and clean up the site of the house. 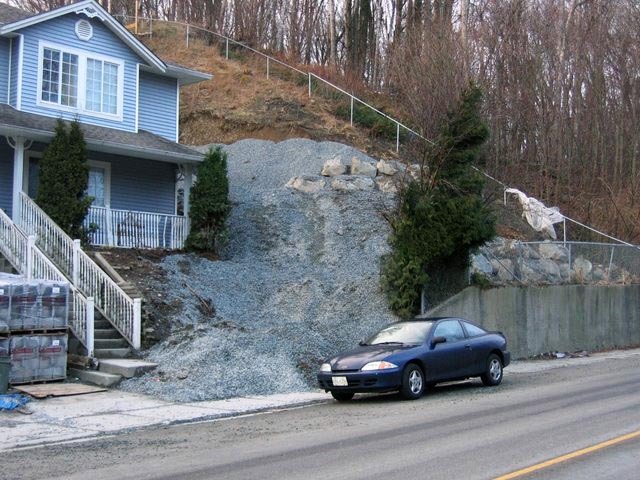 Then we installed 300 tonnes of gravel to support the cut slopes while we waited for permits and engineering (both required for this job, but never talked about with the owners by the other contractors). 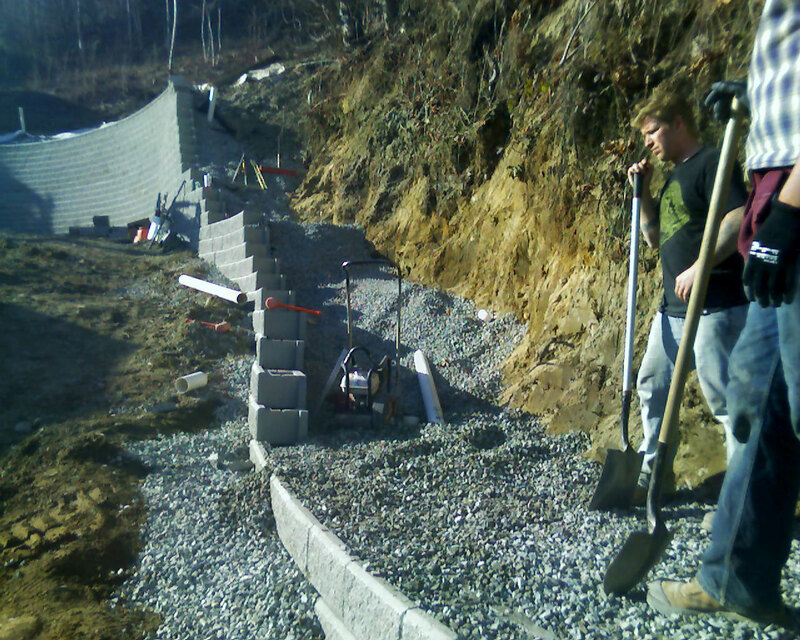 Once engineering and permits were issued, we completed the work to the plans we drew up using a combination of crane trucks, small equipment, and a gravel blower truck to quickly move tens of tonnes of gravel and 1800 blocks to the work area… going up and down the slope with machines for the entire job was impossible. 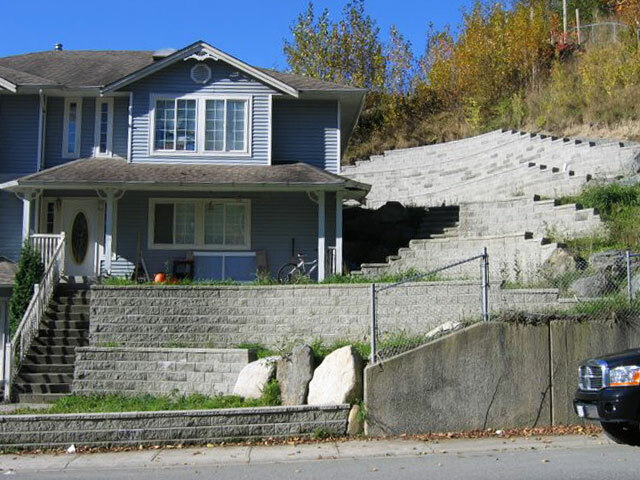 A stable, attractive series of walls and stairs, but at a final cost over three times the original quote. One third of the cost was avoidable, and the real value of the work was about double the original quote. 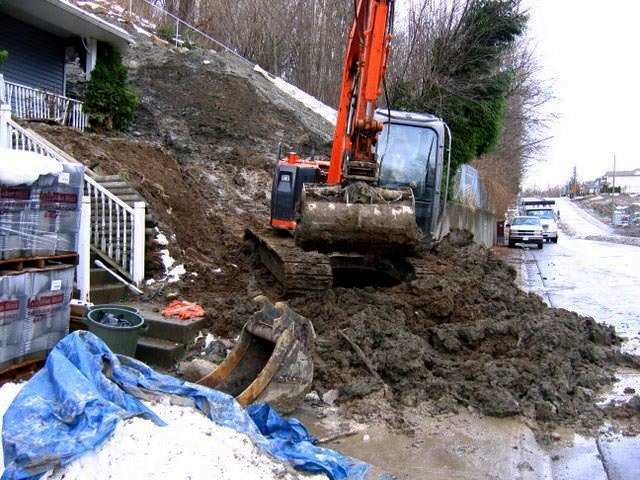 THE ISSUE: One prior contractor, money missing, weeks of delays and a huge mess to clean up… and subcontractors knocking on the door looking for payments. 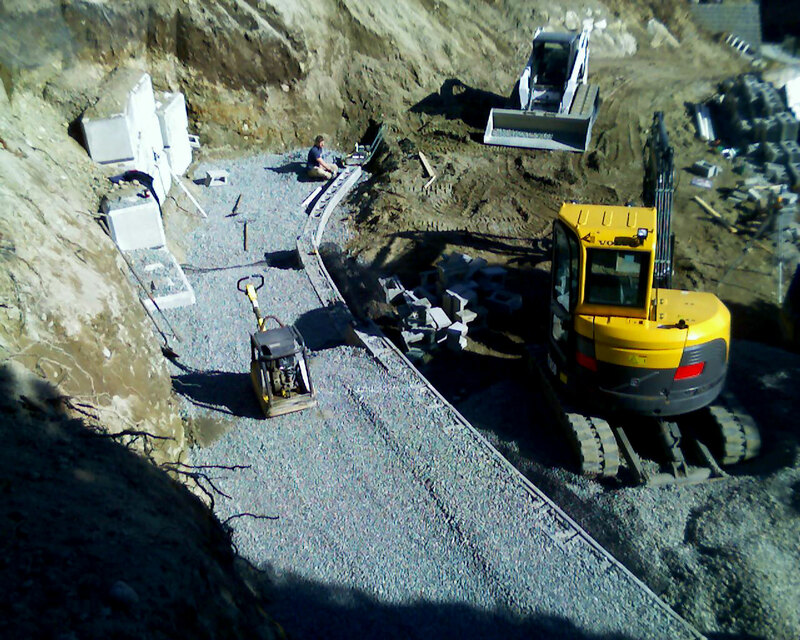 Only one installer and one labour were on site, and work ground to a near standstill. Two weeks later, and barely 20% into the reinstallation, work halted completely. 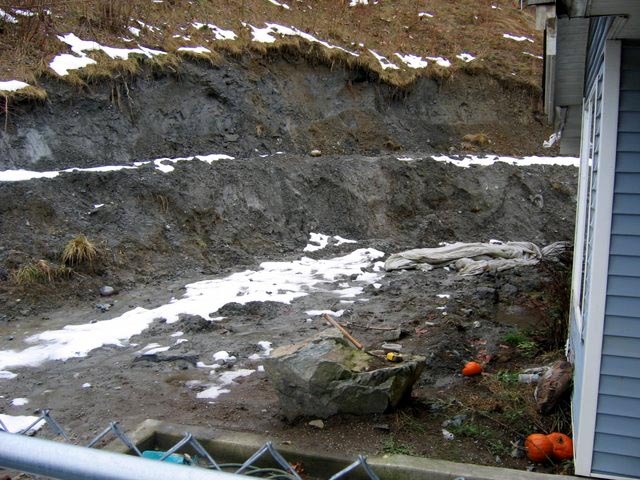 For nine weeks, the owners were given promises, then excuses, then their calls went unanswered… and at some point over this time, the excavation contractor, the laborers, and the supplier all came knocking looking for money. HOW NICE!! The contractor had been paid 70% of the price quoted (A fair price it should be noted), but had not paid out much if anything. 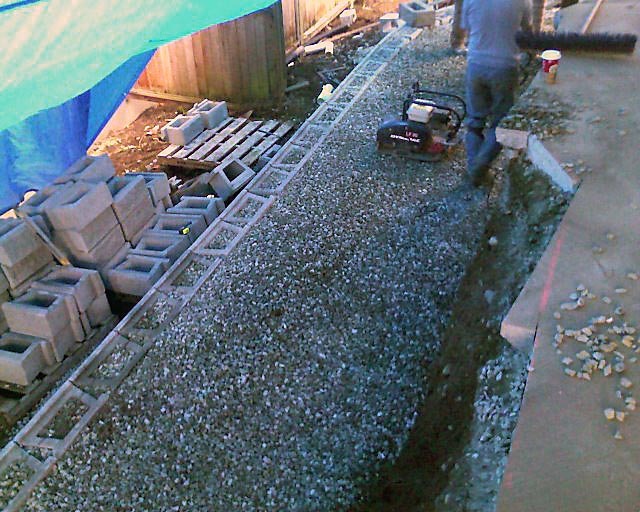 At this point in the job, the carport was being supported by 2 screw jacks… and it was a HUGE carport, the side of the driveway was caving onto a 7-foot deep hole, and once again, no engineering was completed for the work. We were contacted through a string of referrals. 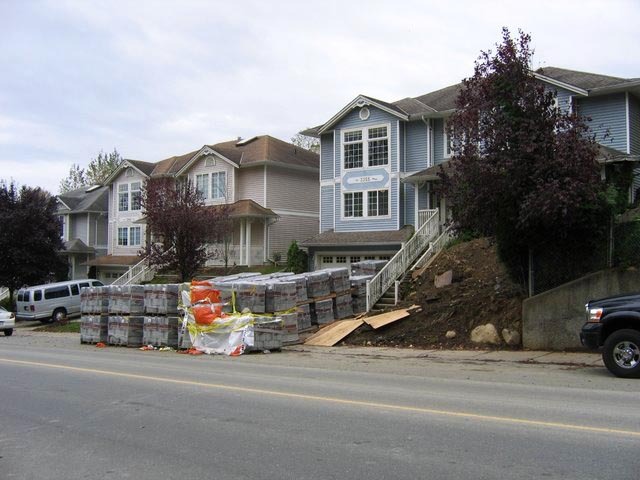 The owners called the block manufacturer (Allan Block is made locally by CCI Industries), who called an engineer (Steve McKinney at TOOK Engineering), who referred us for the repair work. We met with the owners that night, had a proposal to them by the next morning, and were on site within 24 hours to begin work. They didn’t believe us when we said we’d be done in 3 days. We were done in 3 days. Until consumers understand that hiring an unqualified or inexperienced contractor, or going for a “special deal if you sign today” is VERY risky, I will keep relaying these stories. THE ISSUE: Once again, another CON-tractor took on a job without a fitting level of experience or a realistic plan of action, causing grief and depleting the funds of yet another good family. I knew the contractor from years prior. His last company went bankrupt leaving suppliers unpaid (to my understanding) by several hundred thousand dollars, and now he’s in business again and was being sued by 2 different homeowners – one for misappropriation of funds and a second filing for breach of contract and unpaid debts. We were able to find this information online in about 4 minutes. Please always do your due diligence and check references. 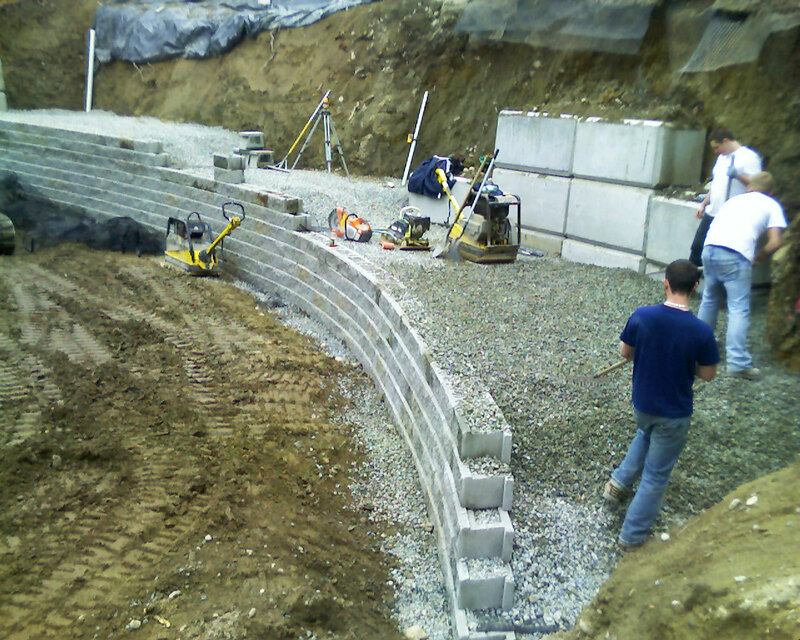 I originally saw this retaining wall project in 2007 when it was just getting started. We were working a few blocks away and I happened to drive past it. 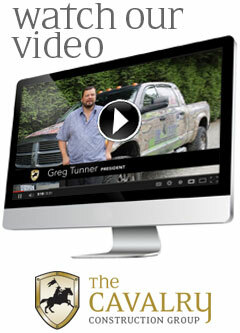 I can tell you that the moment I saw the work site, I knew the job was already going wrong. 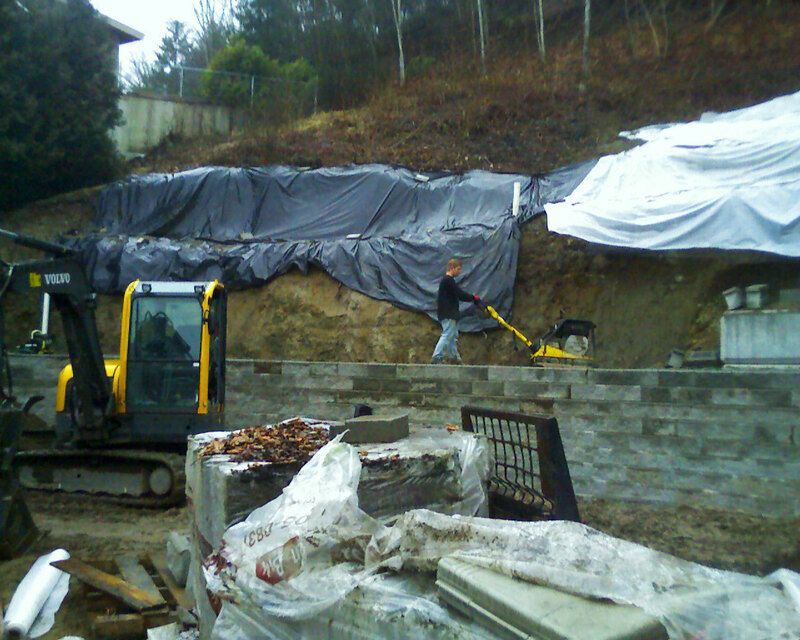 One wall was up… crooked, leaning, and badly built. It was mid-afternoon, mid-week, and no one was working – another bad sign. 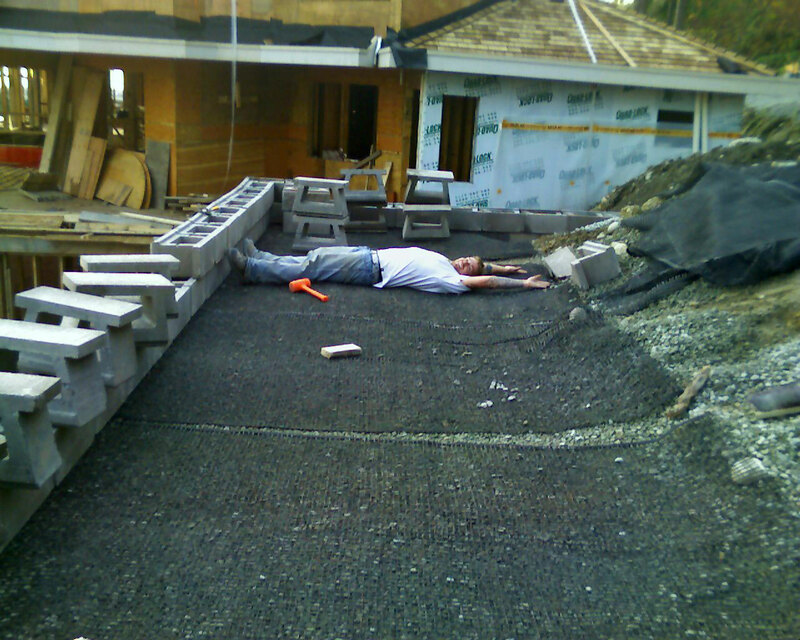 In our market, this is a regular occurrence with less professional contractors, so I just kept driving. 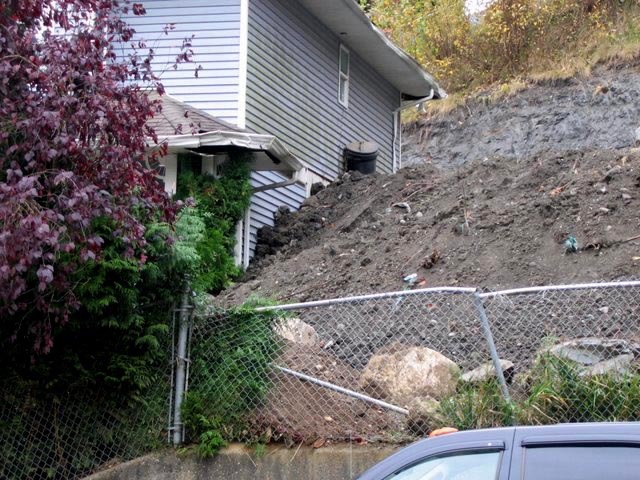 I forgot about the job until about a year later when I was driving by the same house. Surprisingly, the job was still incomplete, so I got out of the truck and I took another look. By then, a second wall had been installed and was worse than the first. The job was overgrown and untouched for a long time, leading me to conclude they hit a major snag – I was right. They had been shut down by the City. 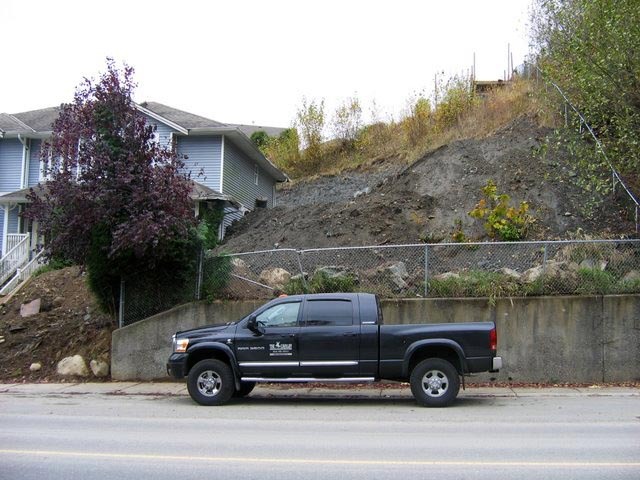 As timing had it, a few weeks later we were approached by a geotechnical engineer hired by the Owners to consult in the completion of the installation. 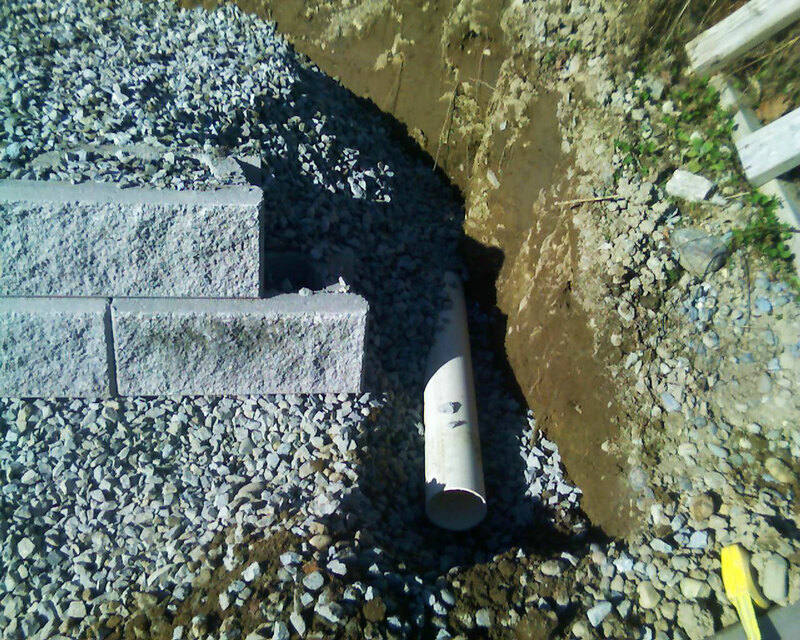 The Owners were taking the Contractor to Supreme Court for damages, and the engineer knew we had done a lot of work in the area and are well known for successful completion of projects with difficult access and challenging conditions. 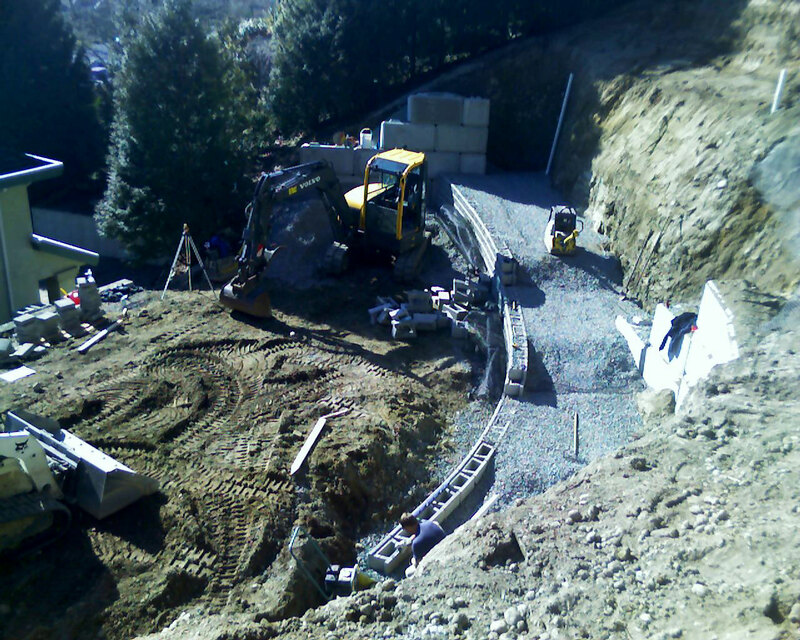 The original plan was to build a tennis court into the hillside behind the house, but with no planning, no engineering, and no permits, there was no chance it was ever going to go well. I was surprised because the work I saw did not look like it was in preparation for the job being outlined for me. 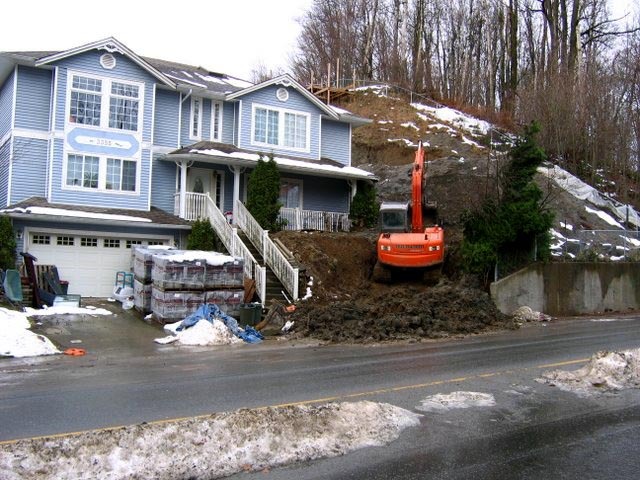 The Owners had been told by the original contractor that it was ‘all planned and taken care of’ and was ‘all sorted out’. It took another 6 months to undo the bureaucratic damage, work out the logistics and get the restoration underway. The original quote was around $85,000. On completion of proper planning and engineering, the cost was going to be more like $400,000!!! 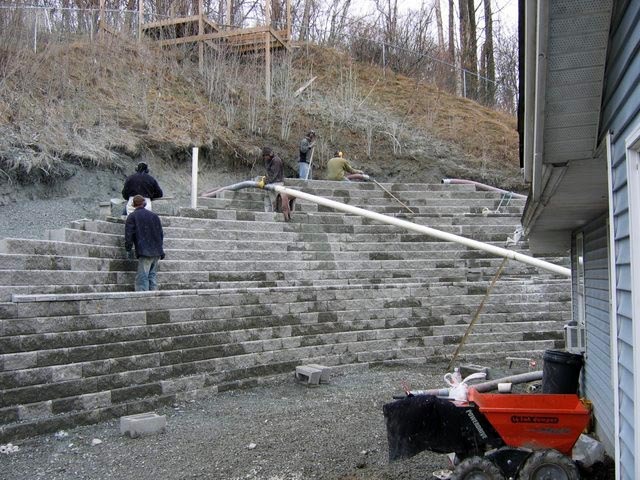 The concept was abandoned and the task became one of restoration and repair instead, but still over $100,000, plus payments made to the first contractor, plus legal fees, city fines (illegal tree clearing, non-permitted work, etc). 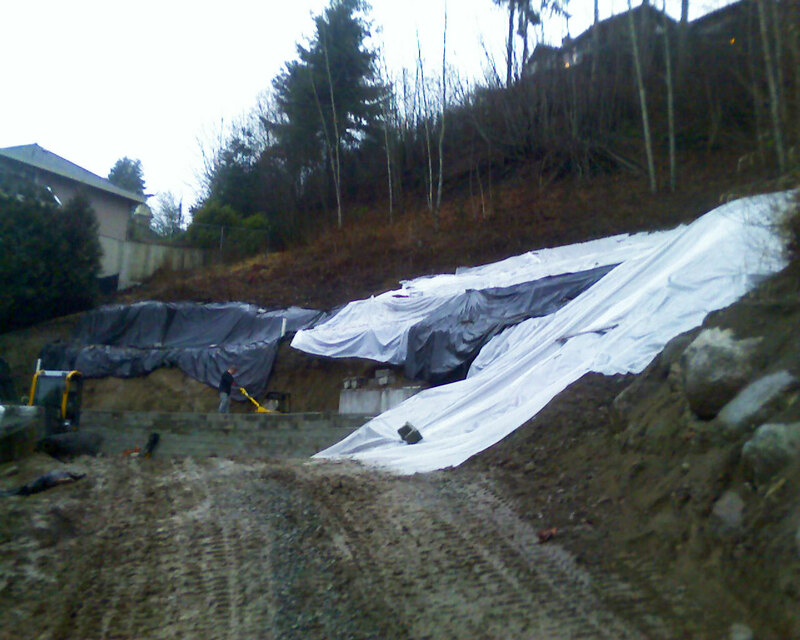 Rebuild the hillside – we had to replace about 500 cubic meters of fill and also control ground water in the rear cut slope. 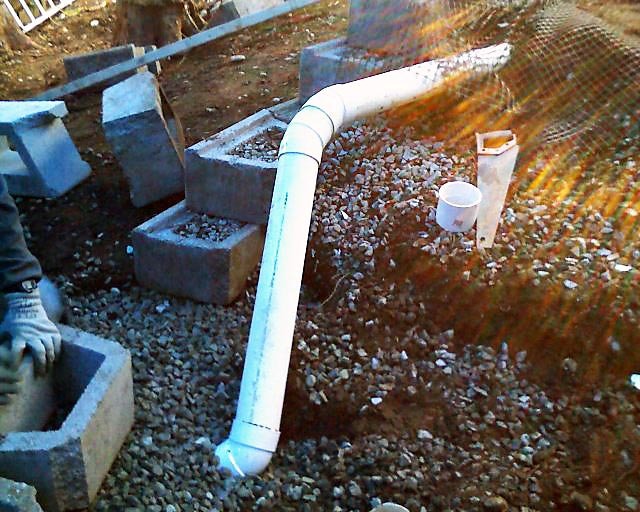 We installed a heel drain that now flows at a constant 3 to 5 gallons per minute. 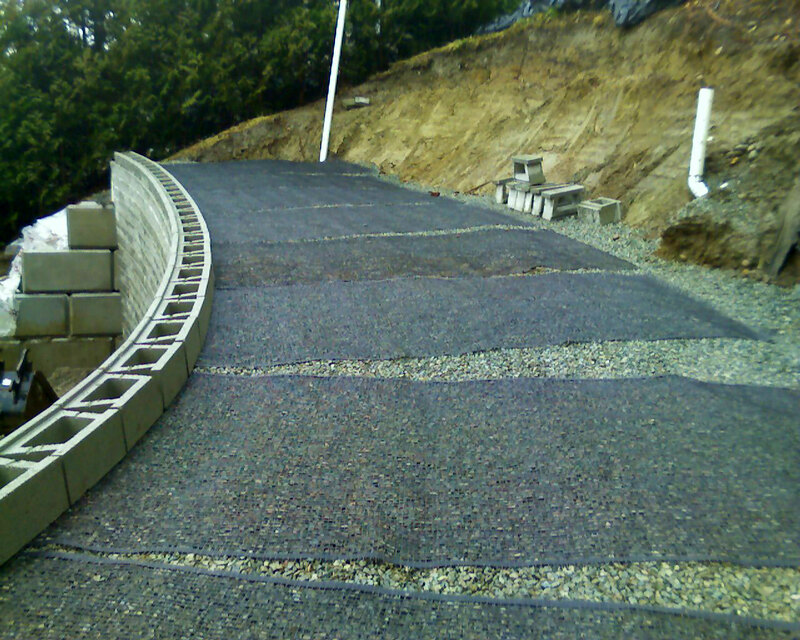 We replaced the fill in lifts (layers) and sandwiched geogrid between lifts for added strength. 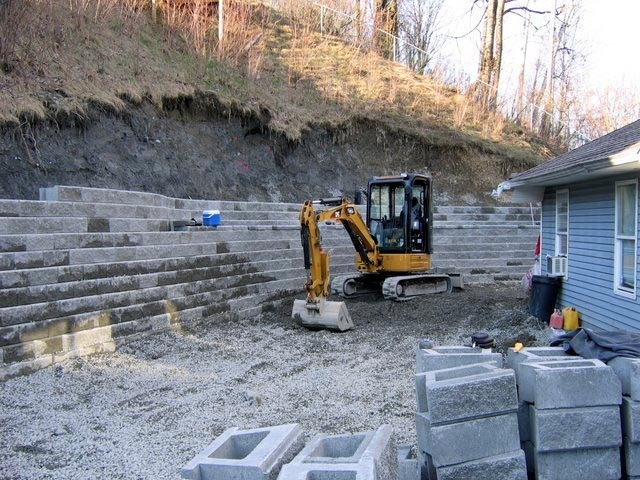 We then began the retaining wall installation to provide the owners with something useful… a 2000 square foot patio used as a play court, entertainment and family gathering area. We installed over 800 tonnes of aggregate and 1500 square feet of retaining walls, plus over 2000 square feet of paving stone and paving slabs for the main patio, steps, a lower sitting area, paths and walkways. A cheap price and high pressure sale usually ends badly. And a high pressure sale for a high-value project is usually not good either (See our other case study – Singh). 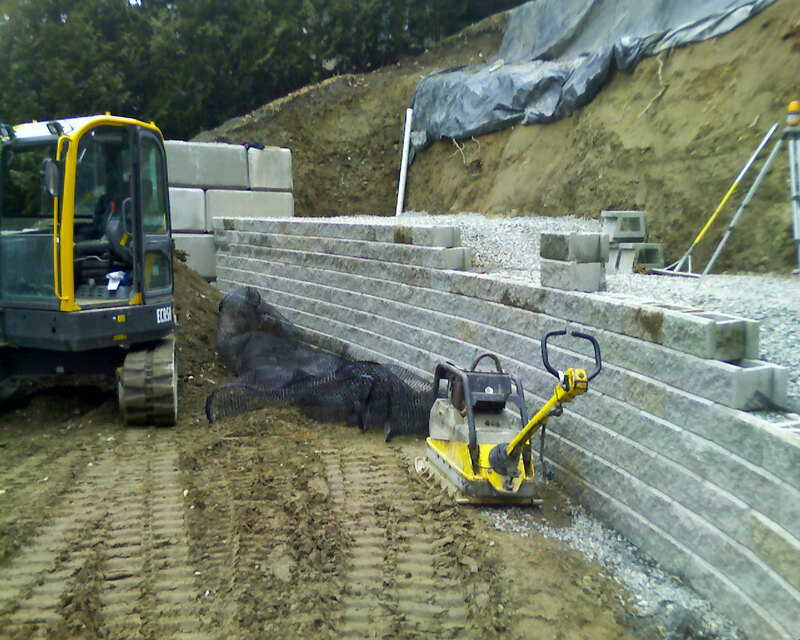 We want you to make your decision to hire our company using the most information available, and want you to be confident that we are the best choice for your project.